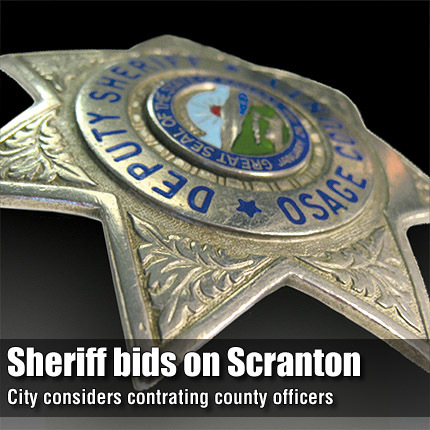 SCRANTON—Osage County Sheriff Laurie Dunn met with the Scranton City Council during its June 7 meeting to discuss a possible law enforcement contract with the city. Following the May 17 council action to reject reappointment of Scranton Police Chief Larry Alexander, the council invited Dunn to submit a bid for providing law enforcement services for the city. The bid submitted by Dunn listed an annual cost of $99,128, and included officers’ pay and benefits, fees for fuel, vehicle service and maintenance, administration, and miscellaneous costs, such as uniforms and training. The sheriff’s bid was based on 80 hours of service in a month, and included a patrol vehicle “supplied, equipped and maintained by the Osage County Sheriff’s Office.” Dunn said that service scheduling would vary, depending on circumstances and law enforcement needs. The bid stated services would include issuance of “traffic citations through the Municipal Court of Scranton” and enforcement of state statute violations. “If there is an immediate danger, it will be dealt with and the city will be notified at the first opportunity,” the bid said.